We are trying out a brand new pizza at all four of our locations! 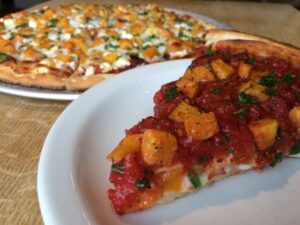 Our Butternut Squash pizza is a completely and totally delish combination of roasted butternut squash, goat cheese, spinach, red onion, fresh parsley, and mozzarella cheese. It’s available stuffed or thin crust for a limited time only. This pizza is the brainchild of employee owner Justin Lassen. He credits the pizza to “the healthy appetites of the San Ramon employee owners” who helped sample lots of trial runs (poor babies!). We are super excited about this new pie (goat cheese in the stuffed pizza is out-of-control! ).